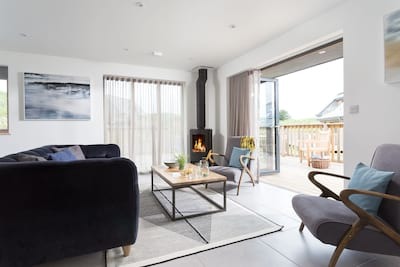 Combining chic interior design with relaxed beside-the-sea style, Samphire has been flawlessly created for your luxury holiday in North Cornwall. This impressive home is located in the much sought after area of Pentire headland, a picturesque haven of tranquil azure blue waters, golden sand beaches, high cliffs and Atlantic surf. 2 indulgent bedrooms offer luxury accommodation for up to 4 guests and the reverse level open plan living ensures a spacious and relaxed holiday ambiance. 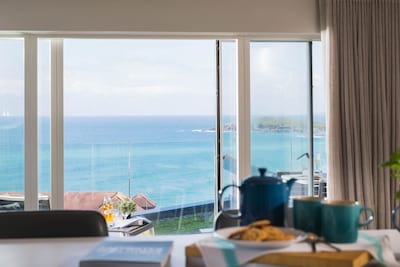 The extensive established grounds lead down to the banks of the River Gannel and the picture perfect beaches of Crantock and Fistral are all within easy access. One well behaved dog is welcomed. Samphire lies at the gable end of the inspired wooden clad Pavillions, this smart building evokes the original village sports Pavillion style of last century with subtle pale render and clading blending beautifully with the coastal scenery. This reverse level 2 storey home has been created with luxury and relaxation in mind. With first class attention to detail the house has been interior designed in cool neutral hues with statement artwork to evoke the drama of the nearby surf and coastline. Set over the first floor are 2 well appointed bedrooms, the master bedroom overlooks the ever changing coastal vistas and offers a contemporary ensuite shower room whilst to the side of the property a super king zip/lock bedroom for children or adults alike. The family bathroom is no less considered with the finest Villeroy and Boch fixtures and fittings. A central staircase leads down to the open plan living/dining/kitchen area and a cloakroom tucked away under the stairs. The generous living space offers ample room for all to relax, in the summer months the room is flooded with sunshine or cosy up in the winter months. The stylish walnut dining table can be dressed up for celebratory suppers or create the perfect space for afternoon tea. An enviable kitchen awaits with all the kitchenalia you could need to whip up a Cornish feast after a day on the coast. The Fern Pit cafe is a short walk away where you can hand pick the plumpest lobster for your supper fresh from the sea, they will even prepare it for you to pair with a bottle of local Camel Valley Brut perhaps? Fold back the double doors from the living space and extend your holiday life into the garden. A paved patio area with all weather dining furniture offers the perfect place for a sunny breakfast or morning coffee, follow the day long sunshine overhead where the evenings sunset fills your terrace with a warm glow. Leading from the paved patio a lush green lawn offers a spacious area for children to play or lead through the private side gate and down to the communal areas along the river bank and down to the shoreline. A well placed communal shower ensure you can de-sand and de-salt before heading to the luxury of your holiday home. To the side of Samphire is a private surf store where all your holiday kit can be securely stowed from body boards to wellies. Enjoy the trip to Crantock Beach, at low tide simply take the foot bridge across the ganel or in the warmer months the passenger ferry shuttles across the river at high tide. The beautiful golden sandy beach of Fistral is just a short walk away and offers a truly Cornish beach vibe from the laid back beach cafe, uber-cool surf shops and a plethora of surf schools just waiting to show you the ropes. The picturesque headland of Pentire is more tranquil area to explore, choose to wander up to the Lewinnick Lodge for a sundowner cocktail or follow the coastpath out the the Headland Hotel where a Cornish Cream tea on the terrace is highly recommended. Whatever the occasion your days are easily filled amidst the coastal energy of North Cornwall. One well behaved dog welcomed, house rules apply and a small pet supplement. Due to the communal nature of the grounds, dogs are requested to be kept on a lead whilst in the garden. The river bank of the Gannel is just a few yards away where dogs can run free and swim at low - mid/low tide. The garden is not enclosed and shared with the other properties in the pavilion. We had a wonderful stay at Samphire. It was spotlessly clean, extremely comfortable, wonderfully quiet and the views from both the lounge area and the master bedroom were stunning. It is a really magical location, with great walking straight from the door or a quick drive to some other stunning beaches, gardens etc. We were both very sad to leave and wished we could have booked it for longer. 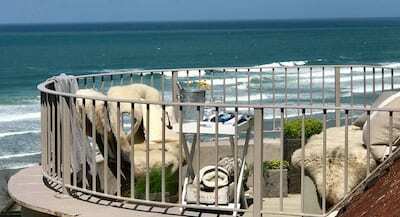 A beautiful property in a stunning location, beautifully decorated and well equipped. We very much enjoyed our stay here. Lovely - more than we expected and very welcome. Lovely place to stay and very well furnished... Very quiet with spectacular views over the river gannel! We enjoyed our stay, especially finding tea, cake and milk waiting for us on arrival. A lovely touch. We have never stayed anywhere so immaculately clean (and I'm very fussy). Had a fantastic holiday in a stunning property. Thank you. All was great and enjoyed a lovely two weeks. Yes holiday was great. Property in an amazing position with great facilities. Property was lovely decorated and perfectly located for our needs. The views were amazing we had a very nice time and will be definitely trying to get back. All seemed quite new and the house was very well equipped. Accommodation was spotless and very good condition. I loved the property I'd stay again. We thought Samphire was fab. A really lovely property in a great location. We loved walking down to the river! We loved the property, the view and the wonderful beds and linen...we could quite easily live there!!! We found Samphire a very well equipped property. We had a very enjoyable holiday and the property was all we could of wished for, the views were great and the property owners thought of all that we needed for a relaxing stay. I can well recommend it to other holiday makers. Thank you.